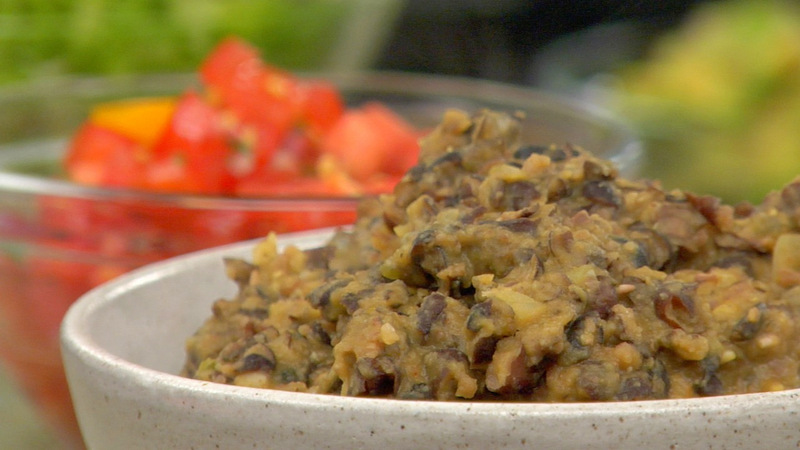 *Note: For added flavor, use this Basic Black Beans Recipe, to make the refried beans with. In a hot fry pan, add the oil. Add the onions and reduce the heat to medium, sautéing them until they are translucent and golden, then add the garlic. *If omitting oil, add onions to a hot, dry pan and move them around rapidly. Once they begin to stick and begin to turn translucent, add the vegetable stock to deglaze and help caramelize the onion, then add the garlic. Next, add the jalapeño and cumin. Stir for a few minutes until aromatic. Add beans and all the vegetable stock and bring to a simmer. Simmer for a few minutes to make sure the beans are soft enough to crush them between your fingers, signaling they are ready to mash. Reduce the heat to medium. Using a masher, mash the beans in the pan until smooth. Season with sea salt and pepper. 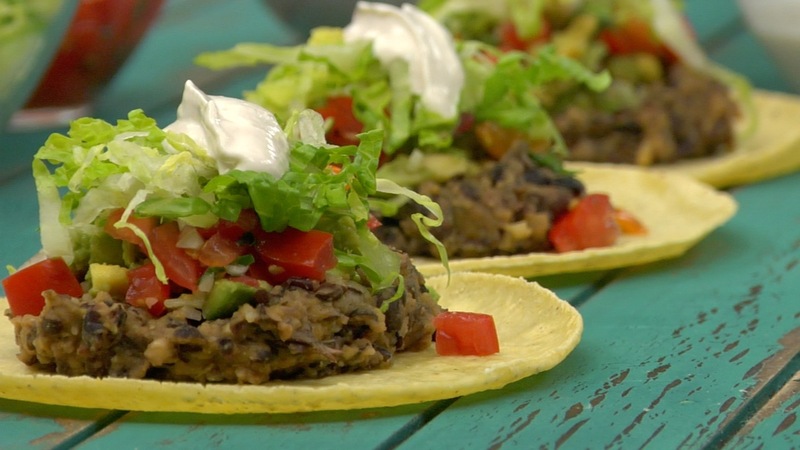 Serve as a dip, in wraps or burritos, or serve with corn tortillas with Salsa Borracha (or salsa of choice), Guacamole, shredded lettuce and a dollop of Cashew Sour Cream. I think i have misunderstood the recipe... Is this 2.5 cups of cooked and drained beans or 2.5cups of beans that you THEN cook and drain? I have used 2.5cups of beans that i cooked earlier today and it seems that there is way too much stock... Please help me!! Thank you! This is written as 2.5 cups of (already) cooked beans. And, yes, I agree with you, Pea, the amount of stock looks like a lot. Part of this is to be used to deglaze the pan when dry sauteing the onions (if you use this technique). There is also some variability with how soft the beans were originally cooked. 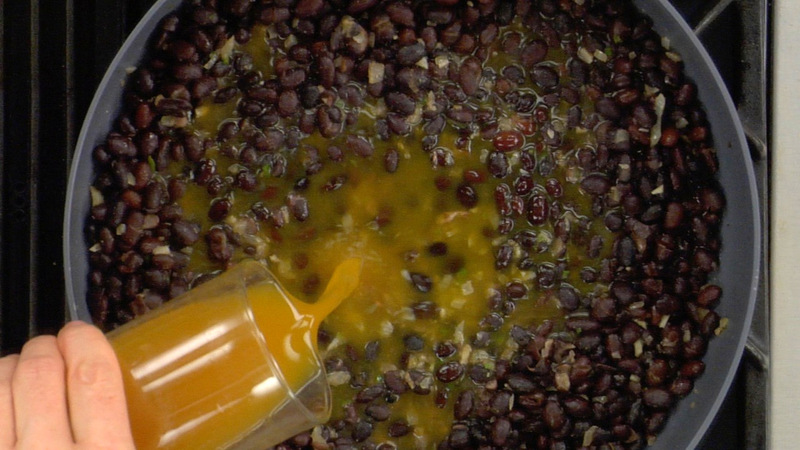 The beans might need more liquid (stock) to soften them up for this preparation. So, even though the procedures directs you to add all the stock at once, I recommend adding half, then adding more as needed.